PEX (cross-linked polyethylene) is a flexible piping used for the installation of both hot and cold water supply lines. Due to its flexible nature, PEX requires fare fewer 90-degree elbow fittings and consequently cuts down on installation costs. 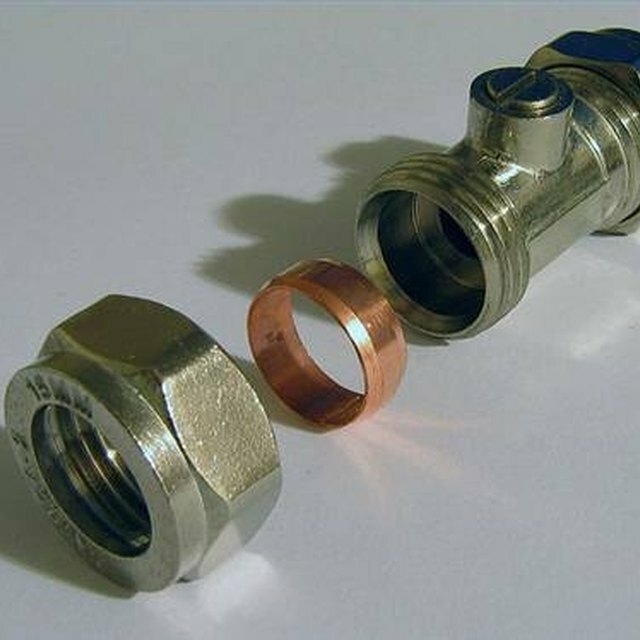 As with regular PEX fittings, PEX shutoff valves have a barbed male end that fits inside the PEX pipe and is sealed in place with a copper crimp ring. Once installed, the fitting is tested to make sure it is water-tight. PEX shutoff valves are installed on both hot and cold water lines. Mark the PEX pipe at the point where it will connect to the PEX shutoff valve -- use a medium/fine point black marker pen. Open the jaws of a tube cutter and place the PEX pipe between the jaws with the cutter's sharp jaw resting against the mark. Holding the cutter perpendicular to the pipe, squeeze the cutter's handles together to cleanly cut through the pipe. Slip a copper crimp ring over the end of the pipe. Push the pipe end fully over the barbed end of the PEX shutoff valve, so that the pipe end meets the bridge of the valve. Slide the crimp ring towards the valve, leaving a 1/8-inch gap between the ring and valve. Position the crimp ring in the open jaws of a PEX crimping tool. With the tool's jaws perpendicular to the ring, close the tool's handles to seal the crimp ring to the pipe and valve. Check that the crimp ring is correctly installed by attempting to slip it into both slots of a "go/no go" gauge. The ring should fit in the "go" slot, but not the "no go" slot. If the crimp ring fails either part of the test, it must be cut from the pipe and installed again.